On Monday September 9, 2013, a monitor at the Exide Technologies facility in Vernon exceeded the ambient air lead concentration of 0.15 ug/m3 averaged over a 30-day period.Â As a result, the SCAQMD is issuing a Notice of Violation to Exide for violation of Rule 1420.1 paragraph (d)(2).Â It is important to note that this exceedance did not cause a violation of the National Ambient Air Quality Standard (NAAQS) for lead; the SCAQMD Rule 1420.1 has stricter requirements to ensure compliance with the NAAQS for lead.Â According to Exideâ€™s approved Compliance Plan, this exceedance requires Exide to curtail its production by 15%.Â In addition, SCAQMD Rule 1420.1 requires daily monitoring of lead for a 60 day period after the exceedance.Â Exide is required to curtail its production until it demonstrates that has achieved an ambient air lead concentration below 0.15 ug/m3 averaged over a 30 day period.Â Exide has curtailed its production as verified by SCAQMD staff.Â The SCAQMD staff has begun rulemaking to address high arsenic emissions and other toxic air contaminants at large lead-acid battery recycling facilities and has released an initial draft of Proposed Amended Rule 1420.1 which can be found at http://www.aqmd.gov/rules/proposed/1420-1/PAR1420-1a.pdf. The battery recycler’s latest infraction stuns activists and officials, who have been calling for the Vernon plant’s closure. September 18, 2013,Â 8:09 p.m.
Air quality regulators have ordered the embattled Vernon battery recyclerÂ Exide TechnologiesÂ to cut production after an air monitor revealed lead emissions had exceeded health standards over a 30-day period. The excessive lead emissions occurred even as elected officials and community members across southeast Los Angeles have been calling for the plant’s closure amid an outcry over high arsenic emissions. Last week, in an unprecedented move, state and Los Angeles County officials unveiled a plan to make blood tests for lead available to a quarter of a million people who might be affected by the emissions. The announcement Wednesday of Exide’s latest infraction stunned local activists and officials. “Here’s my reaction: Oh my God,” said Msgr. John Moretta of Resurrection Catholic Church in Boyle Heights, where parishioners have expressed health concerns about the plant for years and have called for its permanent shutdown. An Exide company spokeswoman did not respond to requests for comment. Air district officials said Exide at first disputed that the high lead readings resulted from their operations, attributing them to a nearby factory. But eventually Exide agreed to cut production by 15%. Under the South Coast Air Quality Management District’s rules, Exide’s lead emissions cannot cause the outdoor air concentration of lead to exceed 0.15 micrograms per cubic meter based on a 30-day average. On Sept. 9, an air monitor on Exide’s property picked up a reading of 1.017 micrograms per cubic meter, resulting in a 30-day average of 0.17. In addition to cutting production, the company must test the air around its plant for lead every day for the next two months, instead of every third day. If lead emissions do not improve, officials said, they can take further steps to limit Exide’s operations. Barry Wallerstein, the air district’s executive officer, stressed that even with the latest spike in lead emissions, the air in the area meets the federal health standard. But the production cut was required to ensure that Exide’s emissions did not cause Los Angeles’ air to exceed such limits. A few years ago, emissions from Exide caused the entire Los Angeles region to be “out of compliance with federal clean air standards that existed at the time,” Wallerstein said. Exide’s lead emissions have plummeted since 2008, Wallerstein said, but he expressed concern about the latest spike, which comes as it is the subject of intense public and news media scrutiny and as inspectors are frequently checking on the plant. “And yet we seem to have one thing happen after another at the facilityâ€¦. It’s puzzling, but it’s something we’re carefully taking note of,” he said. Some critics of the plant said they believe that cutting production will not be sufficient. “Exide has been exceeding lead emissions standards for over a decade. They’ve exceeded arsenic standards as well, and now it’s lead again,” said Bill Gallegos, the executive director of Communities for a Better Environment, an environmental justice group. Community concern about Exide has been mounting since spring, when The Times reported that the air district had found that elevated arsenic emissions from the plant had increased the cancer risk for more than 110,000 people. The plant has also been cited repeatedly by the air district and the state Department of Toxic Substances Control for discharging potentially harmful quantities of lead. After the air district first revealed the elevated cancer risk from arsenic, officials from the state toxics department moved to temporarily suspend plant operations. But Exide appealed in Los Angeles County Superior Court, arguing that the plant did not pose “an imminent and substantial” danger to the public. After a July 2 hearing, Judge Luis Lavin sided with the company. “The Department’s avalanche of conclusions, speculation and innuendo are not a substitute for evidence,” he said in a written order that allowed the plant to resume operation pending an administrative law hearing that began in June but has not yet been wrapped up. Stephen J. O’Neil, Exide’s attorney, declined to comment. Vernon officials question whether the city has any options. Vernon battery recycler Exide Technologies has been ordered to cut production by air quality officials because air monitors near the facility recorded lead emissions that exceed health standards, the L.A. Times reported Wednesday. The higher than safe levels were recorded over a 30-day period, and come on the heels of calls for the companyâ€™s permanent shut down, and an announcement that the embattled company will pay for county residents worried they may have been harmed by lead emissions to get free blood tests at the companyâ€™s expense. The free blood tests will be available to thousands of people living in an area that includes Boyle Heights and the nearby cities of Maywood and Huntington Park, as well Vernon. As EGP reported last week, local residents are organizing with other stakeholders in the region to collectively pressure for the permanent closure of the Exide plant amid concerns that the battery recycler has created a health crisis for hundreds of thousands of people living and working in the region, raising the cancer risk and the possibility of increased neurological deficits in children. The California Air Quality Management District had been monitoring Exide emissions to see if the company has really reduced harmful emissions as it had claimed to regulatory agencies and to a judge who overturned an shut down order by the California Department of Toxic Substances Control, following excessively high readings of lead and arsenic were found in the spring. More costly and complicated testing for arsenic, however, will not be part of the free testing protocol, according to health officials. While many are welcoming the opportunity to be tested, some community and environmental activists are questioning the reliability and value of lead testing several months after the heightened exposure. They worry that the tests are being conducted to placate concerned residents, but will do little to pinpoint the source of any high levels of lead found, since data from the tests are not going to be analyzed or compiled into a study or report, but are for individual consideration only, leaving Exide off the hook. Testing, however, is being conducted at the insistence of the California Department of Toxic Substances Control, Brian Johnson, Deputy Director for DTSCâ€™s Hazardous Waste Management Program, told EGP Tuesday in an email. Testing will be conducted under the direction of the County Board of Supervisors and partner agencies that include DTSC and the South Coast Air Quality Management District, according the Los Angeles Dept. of Public Health. Details as to when and where the free tests will be available are still being finalized, according to health officials. Johnson told EGP that DTSCâ€™s goal for Exide is the same goal they have for all hazardous waste operations, to ensure that neither their current or past operations pose a risk to public health nor the environment. Since 2007, Exide has violated both AQMD and state lead emission safety standards on three different occasions. Earlier this year, the California Department of Toxic Substances Control (DTSC) shut the plant down because the agency found that the facility was releasing hazardous levels of lead and arsenic into the air, as well as â€œmetal bearingâ€ waste into the soil. Under order from DTSC, Exide began taking soil and dust samples late last month at adjacent properties. The samples will be analyzed for lead, arsenic and other toxic chemicals known to increase the risk of cancer, neurological damage and other health issues. Grossberg told Vernon council members this week that the regional water quality control board continues to monitor the storm water plan for offsite water discharges. He said Exide proposes to remove all the existing underground piping and test to see if there is any exposure to the soil or ground water. Council members, not usually very vocal on the issues that come before them, questioned Grossberg regarding the cityâ€™s response to the Exide situation. Mayor Pro Tem William Davis wanted to know what happened to the cityâ€™s request to the AQMD back in April for the agency to issue a health advisory in response to the findings of excessive harmful emissions by Exide. â€œAQMD has not issued a health advisory because it lacks the scientific proof that anyone, not to mention 250, 000 people, are being harmed right now, to date, from any emissions from the Exide plant operations,â€ Grossberg responded. â€œWithout that proof they could not issue the health risk advisory and I cannot issue a health risk advisory,â€ he said, one day before AQMD officials ordered Exide to cut production. Councilman Richard Masiano asked if the city is doing everything it can to ensure the safety of the workers at Exide and its surrounding residents? Grossberg said the city is doing everything within its power, and regularly communicates with AQMD, DTSC. â€œVernonâ€™s Department of Health and Environmental Control continues to share the public concern regarding important public health and safety issues and pledges to do anything within our city power to safeguard the lives of our residents, business employees and residents of our neighboring communities,â€ Grossberg said. Vernon is taking heat from surrounding communities that believe the city can shut Exide down by changing its zoning codes. City Administrator Mark Whitworth asked whether there is a legal avenue the city can pursue to revoke Exideâ€™s permit to operate in the city. It was Los Angeles County that approved using the property where Exide is now located for lead smelting back in 1922, before it was annexed into Vernon in 1959, according to Deputy City Attorney Scott Porter. He said the city cannot change its zoning codes to shut down Exide. â€œThe constitution and zoning donâ€™t work like that. No city may legally amend their zoning code to thereby illegally prohibit operation of a multi-million dollar facility, which has been recently upgraded to the tune of many thousand of dollars, simply to meet air quality standards,â€ Porter told the council. The equal protection clause in the constitution requires cities to treat all similarly situated business owners equally, he said. â€œThe city cannot legally say to Exide owners â€˜even though youâ€™ve never violated our zoning codes, because we donâ€™t like you, youâ€™re hereby shutdown effective immediately,â€™â€ Porter said. Meanwhile, plans to start the blood tests still have other obstacles to overcome. According to DTSC Spokeswoman Tamma Adamek, said while DTSC wants testing to begin and for Exide to pay for the tests, it â€œwill require approval from the bankruptcy courtâ€ because Exide filed for bankruptcy in June, and as a result, a bankruptcy judge must approve all expenditures. BOYLE HEIGHTS (CBSLA.com) â€” Dangerous levels of lead detected in the air near a controversial factory in Vernon have nearby residents on edge. The Exide plant, the largest car battery recycling plant in the West, has been cited for releasing toxic levels of lead and arsenic into the water and air. While the Air Quality Management District has ordered the facility to cut production and revenue by 50 percent to ensure Exide does not emit high lead levels into the air and does not exceed federal health standards, people in neighboring communities are concerned about the plantâ€™s longterm impact. â€œItâ€™s great, but the concern is still there,â€ Boyle Heights resident Miguel Garcia told KCAL9â€²s Suraya Fadel. The plant recycles early 42,000 car batteries daily. Officials at the L.A. County Health Department Wednesday said they are still working on orchestrating a massive screening so that folks can get tested for any kind of lead poisoning. While production may not be underway next door to Garciaâ€™s home, he says he worries about potential health risks and hazards and is considering it. â€œThese chemicals affect the most â€“ children and senior citizens,â€ he said. The fate and future of the plant, which has claimed bankruptcy, is unknown. Toxics regulators tried to suspend operations at Exide Technologies in Vernon, Calif. in April because of arsenic emissions. Now air regulators have ordered Exide to cut production 15% as a result of lead emissions. 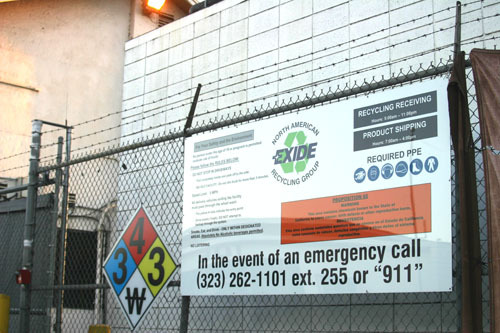 Regulators have ordered theÂ troubledÂ Exide battery recycling facility in Vernon to cut production after an airÂ monitor near the site found unusually high levelsÂ of lead in emissionsÂ comingÂ from the plant. The South Coast Air Quality Management District announced the development on its website. The air monitor found thatÂ emissions from the plant at 2700 S. Indiana St. exceeded the 30-day standard for lead during the period ending Sept. 9. As a consequence, Exide has cut production by 15 percent. The company must now monitor lead emissions on a daily, not monthly, basis. The AQMD is developing a rule specifically to control lead and other toxic emissions from large battery recycling facilities. Only two plants west of the Mississippi recycle batteries. The South Coast AQMD regulates both. Air regulators have focused on controlling arsenic emissions from the Exide plantÂ in recent months. A health risk assessment released in the spring found a sharply elevated cancer riskÂ for people living and workingÂ in East Los Angeles, Huntington Park, Maywood and other nearby communities. Neighbors of the plant have demanded that public officials close Exideâ€™s doors. The state Department of Toxic Substances Control issued a closure order for Exide back in spring, but a judge has allowedÂ the plant to keep operating while the company fights the order. Toxics regulators say theyâ€™re negotiating with Exide to help the plant stay open. Public opposition to Exide has prompted Supervisor Gloria Molina to call for tighter controls for emissions and other toxic substances. L.A. Countyâ€™s Department of Public Health and the DTSCÂ have announced a lead screening program, in which officials will sample blood taken from people who work and live near the plant. Community groups are critical of the DTSC. 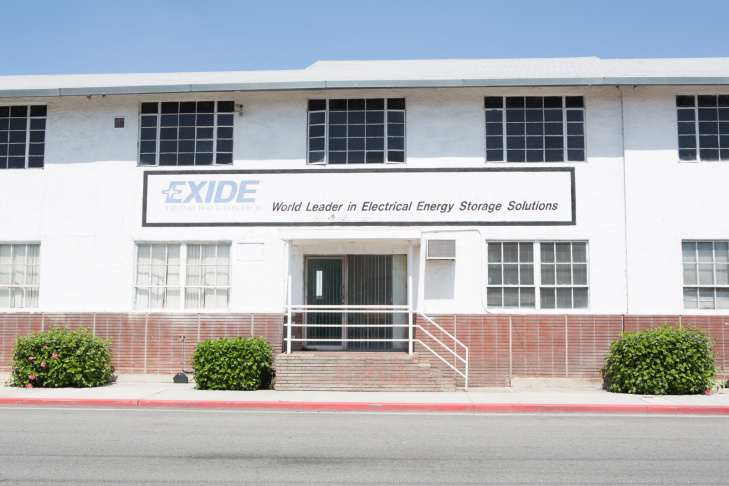 That agency has notÂ issued Exide a comprehensiveÂ operating permit over a period stretching back to the 1980s — a requirement ofÂ state and federal law. Workers at Exide Technologies in Vernon have been told to reduce production by 15 percent after officials from the South Coast Air Quality Management District found the level of lead was above strict local standards. The recent violations at the battery recycling plant will go on the company’s record and can be used to deny them a permanent operating permit. Angie Crouch reports from Vernon for NBC4 News at 6 p.m. on Sept. 19, 2013.